Just in case you’ve been living under a gigantic rock for the past year and a half, Donald Trump is running for President of the United States opposite former Secretary of State, Hillary Clinton. We’re increasingly confused about this whole election, it’s completely mad. So with the election drawing ever closer, we created a fact file to just how weird it was. 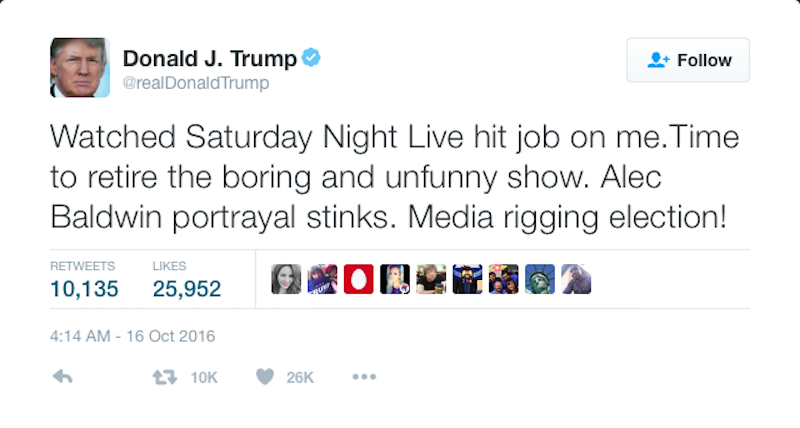 Take it with a grain of salt… Basically, react to this guide in the opposite manner of how Trump reacted to Alec Baldwin’s impression of him on the famous sketch show Saturday Night Live. 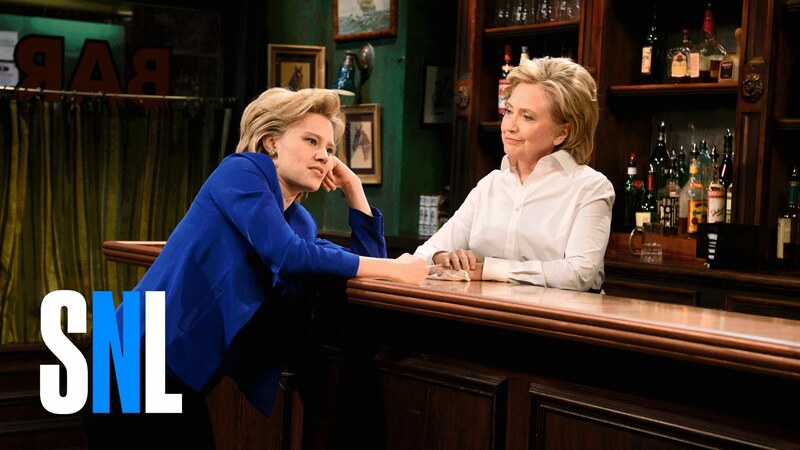 Take inspiration from Hillary Clinton and reach out to your impersonator – just like the Bar Talk sketch that the Democrat did with Kate McKinnon for SNL. Imitation the greatest form of flattery, right?! If you’re a staunch supporter of either side, perhaps don’t check out SNL’s Hillary and Trump sketches but if you’re undecided (or can take a joke), Kate and Alec are hilarious in these roles! Anyway, to forget about SNL for a minute, this is an “all-in-good-fun” fact file to everything you’ll need in your arsenal to make jokes while the results are on. He has incredibly small hands. Try to get a blue suit jacket that is slightly too big for you and the your hands will look almost as tiny as his! Bathe yourself in fake tan but wear those teeny tiny goggles so you maintain the white circles around your eyes. Mike Pence: This guy is terrifying. He’s like a menacing turtle without a shell in a human costume. Not as lizard-like as Ted Cruz, but still entirely reptilian. Vladimir Putin: Now this is a controversial one as their relationship has been subject of debate but there is some strange sort of connection between the two. We smell a couples costume on the cards! Bill Clinton: This question has haunted us since she announced her candidacy – should she be elected, will she and Bill be Mister and Madame President? Cher: Yes this is a weird one but have you seen Cher’s Twitter?! 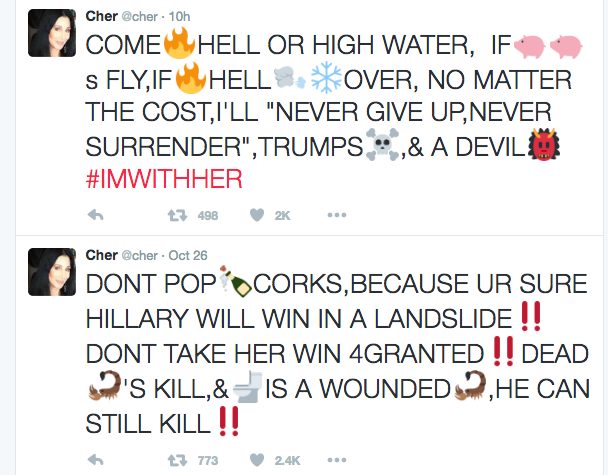 It’s not so much pro-Hillary, but so anti-Trump it’s actually quite admirable. Remeber when that eagle attacked him… was it a sign? When Jeb Bush uttered the words “Please clap” when the room was quiet during one of his rallies, or just Jeb Bush in general. He doesn’t know how to work a zip up hoodie, how could he have been president? Ted Cruz – Zodiac Killer? Robot? Lizard in a man suit? Who knows. So there we have it. If you’re watching the results of the election with mates, then check out our USA Morphsuit – the perfect way to be patriotic without telling people of who you voted for. Or the perfect way to stand out and tell everyone who you voted for. It’s up to you. Next Post Grab your 2016 US Presidential Election Goodies!